The elections of February 23 have come and gone. In a sane environment, this period would be used for a fruitful interaction between the outgoing and incoming senators to exchange ideas and ventilate approaches that will ensure a smooth transition, thereby ensuring that Anambra Central continues to enjoy the fruits of effective representation. Unfortunately, Anambra central is once again witnessing the same rascality and madness that have characterized previous elections. It has become prevalent for people to contest elections and before even the election is conducted, already start making arrangements to go to court to thwart the people’s choice. Some don’t even campaign but go to court after the election to frustrate the winner and the voters in a bid to reap where they did not sow. Some have turned it into a money making scheme to assist the more wealthy opponent of the winner create parallel court cases to strangulate the actual winner financially. 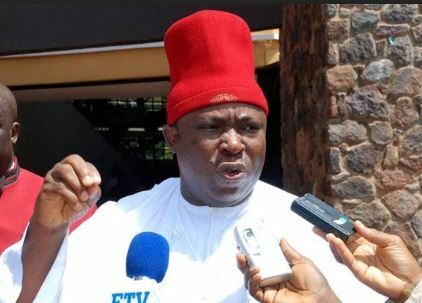 It will be recalled that Chief Victor Umeh, even before the elections was threatening to go to court to challenge the candidature of Senator Uche Ekwunife, notwithstanding that they belong to different parties. It will not be far-fetched to believe that the other parallel suit challenging the election of Senator Ekwunife by one Barr. Tony Chukwuelue on the grounds of omitting the SDP logo by INEC may be reminiscence of the proverbial hand of Esau but the voice of Jacob. Anambra Central is now becoming notorious for instituting parallel law suits against Senator Uche Ekwunife, all in a bid to frustrate her and deprive the people of Anambra Central of their choice. It is therefore time for all Anambra Central stakeholders to rise and reject this recurring affront to their collective will. These law suits are not just against Senator Uche Ekwunife but a challenge to Anambra Central people. It will not be out of place to caption the suits as those between Victor Umeh/Tony Chukwuelue Vs Anambra Central. Silence and indifference are not options here. Anambra Central cannot sit back and say it is a dispute between Iyom and Victor led spoilers. Anambra central suffered from non representation for most of the 8th Assembly due to the greed and selfishness of the same man who is bent on once again dubiously annulling the sacred mandate freely bestowed on Senator Uche Ekwunife. As it is in Igbo tradition, we do not look the other way when a rascal takes it upon himself to rubbish the collective or majority decision in our communities. Tampering with our collective mandate, 7/7 is equivalent to sacrilege and must not go unpunished. It is time to teach Victor and his fellow shenanigans a lesson that will reverberate all over Igbo land so that this madness can stop once and for all. Men must stand up and let Victor know that he and his gang of freelance litigants do not represent us and that we men abhour their evil machinations. Victor must not be allowed to export the anarchy he instigated in Aguluzigbo into Anambra Central. Aguluzigbo, has remained without an Igwe or PG all because one man decided that it is either he has his way or everything must ‘be scatter, scatter,’ as the famous Fela would say. Anambra central needs to be shielded from another period of uncertainty created to satiate one man’s greed and gluttony. Our stakeholders, especially the men, need to rise up to condemn this evil machination, and in so doing, demonstrate in very clear terms that we don’t support the oppression of our women, but value our women of talent and would encourage them to reach whatever height their ability can sustain. The multiple cases against her now and in 2015 by essentially men is beginning to suggest that we do not want our women ( mothers, sisters, daughter’s, etc to succeed but that we will conspire to create a glass ceiling above which must not overcome. The men of Anambra Central need to stand up and be counted among the real men that oppose the suppression of our women. I was having a discussion with some of my friends from the South West and they suggested that it appears that Anambra men are always ganging up against Senator Uche Ekwunife, and asked when will Anambra women be liberated? Fortunately, I am convinced that majority of our men do not belong to this group of mean and retrogressive men, hence the overwhelming support Senator Uche Ekwunife enjoyed in 2015 and 2019 from men. For this support not to be rubbished, we men need to mobilize our constituencies to protest against the Victor Umeh led misogynists and ask them to back off this lady and look for other jobs to do. To our indefatigable women, you need to prominently defend the victory of your fellow woman, whose victory you ensured through your massive votes. Your partners should not be allowed to be docile here. You need to exploit your influence in the family to get your men to fight to extricate Anambra Central from the strangle hold of these democratic deviants. This fight to extinguish political rascality from Anambra Central should not be limited to the good people of Anambra Central. Our Governor, Chief Obiano has a role to play. He should call Chief Victor Umeh to order. The ruling party, APGA and the Governor gave him a massive support before and during the election. If in spite of this, he still lost the election, 7/7, the Governor needs to advise him to do the honourable thing and withdraw the case from the election Tribunal. In fact, this should be an opportunity for Governor Obiano and his government to begin to severe this umbilical cord that is likely to eventually lead to still born. Governor Obiano is better admonished to note that this mad dog after attacking Senator Uche Ekwunife will turn against its owner, Governor Obiano. My Good people of Anambra Central, we must do all in our power to prevent a repeat of 2015, when the Appeal Court dubiously nullified Senator Uche Ekwunife’s victory. Chief Victor Umeh should not be under any illusions that the fraud of 2015 will repeat itself. Even if he once again buys the judges, he will never smell the red chamber again. We cannot afford to descend once more into political uncertainty or allow somebody with limited capacity and dubious credentials to be the face of Anambra Central in the red chambers. Those of you that saw or witnessed the issuance of certificate of return to incoming senators at the International Conference Centre, Abuja, would have seen, first-hand, what we missed and likely to miss if we do nothing to stop these mad dogs. I cannot argue against a colleague who suggested that it looked like a welcome party organised in honour of Senator Uche Ekwunife by her colleagues. The manner in which her colleagues were swarming around her like bees to congratulate her was a beauty to behold. It showed the type of warm relationship she enjoys among her colleagues, a trait that will be very useful as she gets back to the red chamber in readiness to attract to Anambra Central the dividends of democracy. Her charisma and swagger were obvious for all to see. We can contrast this with the lonely figure typified in our current representative, exemplified by his motions consistently being dead on arrival. Tufiakwa na anyi ga ekwe ka onye na alu agwu je gbanwere anyi onye ga echi anyi ozo. Anambra central cannot allow a mad man to continue to stand between their legitimate choice using illegitimately acquired money. Victor has always fed from government since he cannot point to any job outside APGA that he has done for a living. He has for years now been collecting monthly from government, 20 million Naira, in the form of irrevocable standing payment order. This is the money he has been throwing about to corrupt our vulnerable youth and sponsoring multiple court cases to overturn the people’s choice. Anambra State Government needs to be confronted and persuaded to terminate this monthly largesse to Chief Victor Umeh. He has always believed that he can buy over any person and whatever he wants. To him, the system can always be manipulated and if that fails, buy it. Without practising for one day, he bought the Fellowship of the estate surveyors. When APGA was asked to nominate somebody for the conferment of national award, he nominated himself. When APGA was asked to nominate a member to the constitutional conference, again, he nominated himself. He has always avoided competition and used his chairmanship of APGA to manipulate himself into positions. The only person that has ever stood between his having his way unopposed is the indefatigable Senator Uche Ekwunife. It is therefore not surprising that even before the election, once Iyom was confirmed as PDP candidate, he started wetting his pants. And lo and behold his worse fears materialised as he was resoundingly rejected by the seven local governments in Anambra central in favour of Agu Nwanyi, Iyom Uche Ekwunife. Having failed at the polls, he has resorted to what he knows best. He has, presently, in addition to his own case been associated with other cases, all with the selfish aim of making a mockery of the will of Anambra central voters freely expressed on 23 February 2019. It is time for Anambra state central to rise up in unison to reject this rascality and madness. Victor had opportunity to go to the senate but had nothing to show for it, because everything must be about himself while others must worship him. It is therefore not a surprise that none of his motions enjoyed the support of his colleagues. He carried his foolish loquaciousness and brigandage reminiscent of his APGA hegemony to the National Assembly and was promptly brought down to the ignominious level that he belongs. His misguided supporters continue to brandish his so called humanitarian activities, as if senators are elected for humanitarian activities. There is no better time than now to award Victor Umeh that certificate he has been longing for and which he very much deserves, that is the Certificate of Retirement from politics. Anambra Central needs to tell Chief Victor Umeh in very clear terms that he has a choice, to either change from O bata Osu, (oBo) to Ochudo or be banished into political oblivion. The choice is his.